That is one long name for a saw. Please note right away though that this is a mitre saw designed for contractors who work on building sites. It is not suitable for the home user. The 100 volt saws use a step down transformer for increased safety as part of recommended builder regulations. If you are a home user, then check out our top 10 list of D﻿ewalt saws, and pick one that uses the standard 230 Volt UK supply.​ For mow though, let's have a more detailed look at this model. 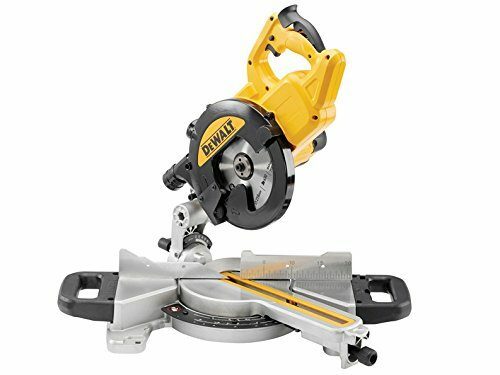 As I mentioned earlier, there are not a lot of reviews to be able to make a proper assessment of this mitre saw from Dewalt. Of the few that do exist, it is rated very highly, with all buyers giving this one the thumbs up. The dust extraction is according to buyers much improved from previous versions of this saw. Dewalt have also stated that the ​base and fence have been machined to meet the accuracy requirements of the most demanding applications. Older versions also had a head lock, which is of course used when you are moving the saw around from location to location. This has been improved as they have now added a ​traverse function for trim applications and ease of transportation.